Is Your Swing Hot or Not? 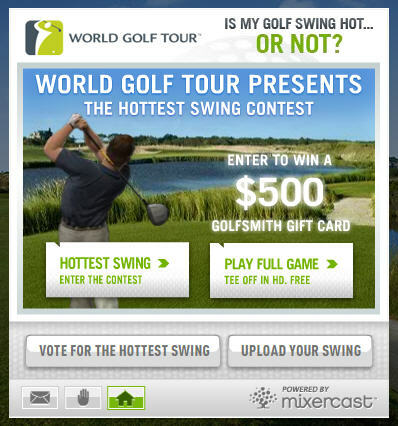 If you haven't posted your hottest swing for a chance to win a $500 gift card to Golfsmith, do it before June 30! In the meantime, check out the great swings that have been posted so far and cast your vote! Far Hills, N.J. - The United States Golf Association and World Golf Tour (WGT) announced Wednesday that they have formed an agreement to host the first Virtual U.S. Open Championship on www.USOPEN.com. Developed in partnership with Bethpage State Park in Farmingdale, N.Y., the Virtual U.S. Open will take place on a state-of-the-art simulation of the Black Course at Bethpage, allowing golf enthusiasts everywhere to play an online golf championship from their computers at no cost, at the same time and on virtually the same course as the actual U.S. Open competitors in June. Visitors to www.USOPEN.com, the official Web site of the U.S. Open, can play qualifying rounds for the Virtual U.S. Open, beginning May 25 through June 21. The top 156 qualifiers plus ties will then square off for the Virtual U.S. Open title on June 22. The winner will be crowned the USGA Virtual U.S. Open Champion and will be a guest of the USGA at the 2010 U.S. Open at Pebble Beach Golf Links in Pebble Beach, Calif.
A closest-to-the-hole challenge on WGT’s virtual Bethpage Black will be available starting April 13, on www.USOPEN.com for players to test their skills, before the Virtual U.S. Open qualifying rounds begin. WGT has utilized its patented technology to bring Bethpage Black to life online. First, nearly 100,000 high-definition images were taken of the course from the ground and with helicopters using precisely mapped GPS coordinates. These images and additional data collected from the course were then translated through WGT’s proprietary physics engine to enable players to virtually experience Bethpage Black within a photo landscape. Championship tees and hole locations, U.S. Open-quality rough and accurate green contours and speeds all combine to make this the most realistic championship golf experience ever offered online. Play Kiawah Back 9 and Wolf Creek Now! Stroke Play on 18 holes! WGT players now have full 18-hole access to The Ocean Course on Kiawah Island Golf Resort. Players have the option to play the front 9, the back 9 or the full 18. Look for some April tournaments to feature the full 18, so practice up! 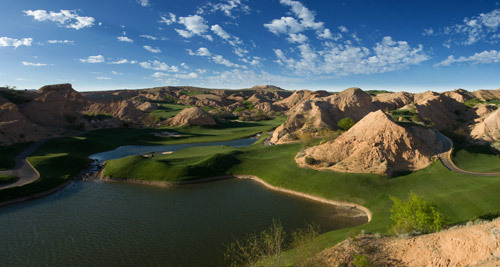 Play a nine-hole challenge at Wolf Creek Resort, tucked into the northeast corner in Mesquite and carved beautifully out of the Nevada desert. Ranked as one of Golf Digest's toughest courses in America, Wolf Creek's challenging layout is matched only by its breathtaking scenery. Click the PLAY NOW button to experience it for yourself! Hit the ball farther with the 2009 WGT Tour Starters Irons. These irons are tempo-matched to the more advanced drivers so the swing meter speed will be similar. Visit the Pro Shop and add them to your bag today. Now you can easily invite your friends to play WGT. Simply go to your Profile page and click on the "Invite Your Friends to Join WGT" banner. This feature helps you find people you know who are on WGT with an in-game friends invite, and also helps you send emails to friends who do not have a WGT account. We have changed up the green speeds on Kiawah to be faster and more true to the real-world course. You should be able to change and save your clubs with no problems now. The following awards have been fixed, and you should get them going forward. Birdies in a Game, Closest-to-the-Hole Accuracy, and Double Eagle. A few changes have been made to decrease swing meter "stuttering". We will continue to investigate these issues to make the game more responsive. You can now see the tournament you played in your score history, instead of just the course you played. Delete links should no longer disappear after a certain number of posts have been reached on your profile page. As a result of adding new courses, it was necessary to wipe the replays again. We apologize for any inconvenience. Congratulations to the following recent tournament winners! Most shots from the fairway and rough call for full swings. A full swing delivers the most power, causing the ball to travel the farthest of all types of swings. Full swings are the most common types of swings on the golf course. Punch shots are flatter, shorter swings that cause the ball to fly lower than a full swing. Punch shots are useful when there is high wind or an obstruction in front of you, like a tree, that you need the ball to fly under. Pitch and chip shots are compact, controlled swings that are useful around the greens. Pitch shots put more loft on the ball and travel further than chip shots. Chip shots are even more compact than pitch shots. Chip shots are most useful near or on the fringes of the green and give you the greatest amount of control. Flop shots are touch shots that cause the ball to fly very high and stop quickly. Flop shots are useful when there is an obstruction in front of you, like a sand trap, which you need the ball to fly over. They are also useful when you don’t have a lot of green to work with and need the ball to stop quickly by the flag. Flop shots can be hit only with your wedges. It happens every month--someone enters a tournament and wins, but they never receive the prize because the email address provided to us at registration is incorrect. Don't let this happen to you! Check the email address you have on file with us at https://www.wgt.com/user/contactinfo.aspx and make sure it's correct. If you update it, be sure to click the "Update" button at the bottom of the page when you are done. Have fun! We launched some new features today that we hope you will enjoy. Below are a few of the highlights, and the full list is posted in our forum. Remember that this month, most of the tournaments will start on March 10 in order to give everyone a chance to get a feel for the changes. We have provided every player with a free WGT Starter set of clubs, which will replace your "Pre-Beta" set. Your player is automatically equipped with this improved set of clubs, so play now and let us know what you think. The WGT Starter set is meant for beginners and first-time players. We will release more clubs in the near future for advanced players. PLEASE NOTE: One side effect of these changes is that all of your saved replays will be wiped from the site. We are working on a solution in the future where we will no longer have to wipe the replays when we make these types of updates. The beta version of the WGT Virtual Pro Shop is available for a sneak peek! The Pro Shop lets you upgrade the golf equipment your player uses in the game. Just like in real golf, the right equipment combined with the right amount of skill can give you longer, more accurate drives or better touch on and off the green. Visit the Pro Shop to compare and purchase new clubs, and use them in the game to maximize your potential. Available today are the Ping G10, TaylorMade Burner, WGT Tour Drivers. We are working on many more clubs and they will be added as soon as they are ready. To equip yourself with clubs you get in the Pro Shop, mouse over the My Settings tab in the game menu and choose My Clubs. Once you are in the My Clubs interface, click and drag the club you want to equip, from the Inventory section into the In My Bag section. Click Save to keep your selection. You can also access My Clubs prior to teeing off by clicking the View/Edit Clubs button. Starting this month, players in Norway and Australia are eligible to play in some leaderboard (score-based) tournaments, and players in Japan are eligible for prizes in the sweepstakes tournaments. We are working on our next batch of countries, so stay tuned! Keep in mind that each month we will run an international tournament where players in every country can compete for bragging rights. This month's international tournament will commence on March 9. You can now share replays with your friends more easily. After watching a replay, click on the Share button, enter your friend's email address and a personal message and click the Send button.